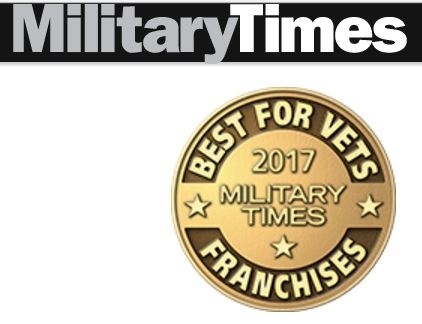 Congratulations to Mr. Handyman, Mr. Appliance, Molly Maid, The Grounds Guys, Aire Serv and Rainbow International Restoration for making the 2017 Military Times Top 43 Best for Vets Franchises list. Franchises from across the country were ranked in six industry categories: three-year continuity rate, three-year growth rate, initial investment, start-up cost discount, royalty discount, and Reservist help. Mr. Handyman ranked highest for Dwyer Group brands at 24th, Mr. Appliance ranked 27th, Molly Maid ranked 28th, The Grounds Guys came in at 34th, Aire Serve at 42nd and Rainbow International rounded out Dwyer Group brands in the 42nd slot. There was a strict application process and methodology to determining the rankings. See the entire list.